One of my favorite types of sweet bread is banana bread. I have searched and searched, but this little piece of heaven is not available anywhere here. The people are not aware that there is such a divine taste in this world. So I thought I would make a batch and share it with the Mexican world. Jose was the biggest fan. Since I’ve first made the bread, this has been pretty much a weekly happening in our home. We’ve also shared this with our neighbors and friends. This last Sunday morning we were in a rush out the door to catch the Combi to go to church. I hadn’t eaten so I grabbed the rest of the banana bread. It’s a good thing too. When we got to church we found that there was no bread for the sacrament. So our sacrament bread was banana bread that day. And PS this is OK. We were in a bind and didn’t want to spend money on Sunday. 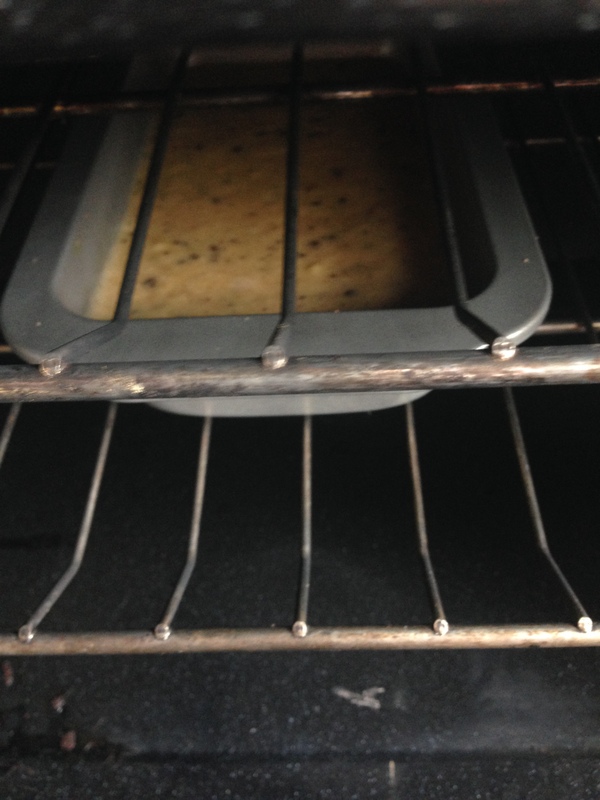 So…banana bread it was! I found the recipe on SimplyRecipes.com. This is definitely a keeper! 1st preheat your oven to 350 degrees F. Then you smash the bananas in a mixing bowl. If they are lumpy like above…that’s OK. Adds a little character to the bread! Next is the butter! YUMMY!! 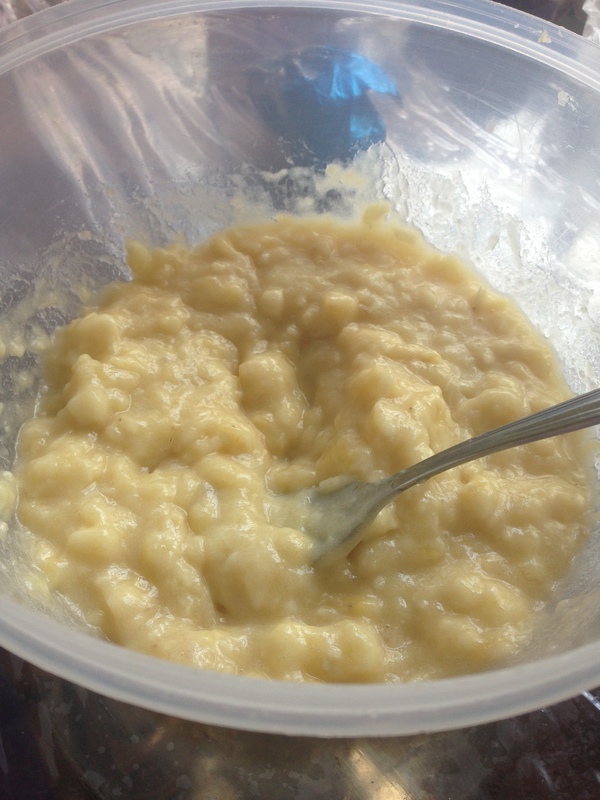 Melt 1/3 cup of butter and mix it into the banana mush. I didn’t have a 1/3 cup butter so I used about 1/2 butter, 1/2 vegetable oil. Great substitute. Baking soda anyone? Add a teaspoon of baking soda to the bowl of love. Stir into to mush. See this salt in my hand? DON’T ADD THIS MUCH!!! A pinch will do. Next comes the sugar. The recipe calls for 1 cup of sugar, but today I used 1/2 cup of white sugar and 1/2 cup of brown sugar. Oh wow did it turn out amazing! I recommend switchin up the sugar bit. Stir in the sugar with a fork. PS this whole recipe is stirred with a fork. No power tools needed. EGGS! We got em. One will be enough. Make sure to beat the egg in a separate dish before adding it to the mix. And also…I love this photo. Add a teaspoon of vanilla extract. Or if you speak Spanish…Vainilla. I love Mexico. Flour ladies and gentlemen. So last time I used flour I was making Pizza with our little church family group of 10 people. One of the sisters got so confused by flower and flour. It took a good while and a good laugh to be able to explain to her the difference. 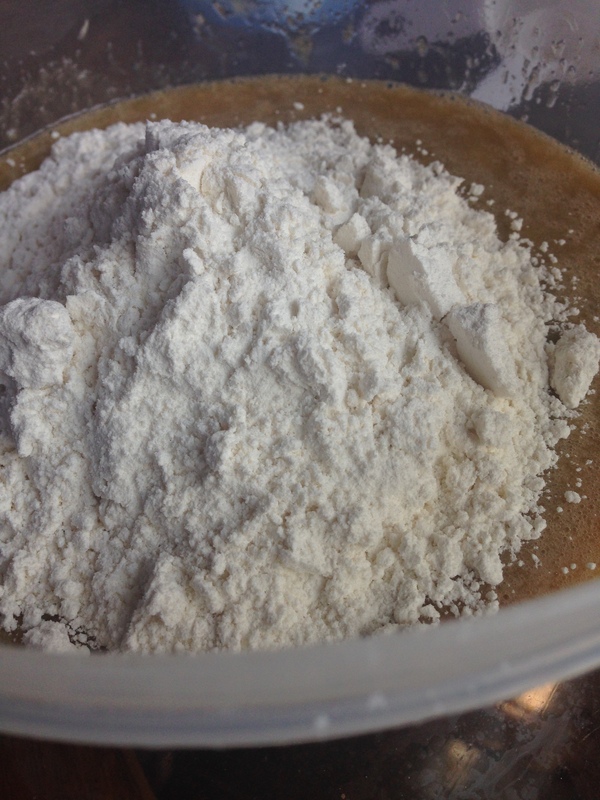 Add 1 1/2 cups of FLOUR. Harina. And mix. For good measure you might as well add chocolate right? I suggest chocolate chips, but this picture says otherwise. These actually are chocolate chips, I promise. They just melted a little because it is so freakin hot here. I put them in the fridge to reform and, well, they aren’t that pretty anymore. But they taste so good in the bread! Pour your batter into a greased pan and stick it in the middle of your oven for the best distribution of heat. As I was growing up, my mom taught me the value of cleaning as you cook. It keeps your kitchen clean and saves so much time. So as I waited for the bread I cleaned the dishes. And, of course, licked the spoon. It’s your right of passage for cooking something for your family!! Also just want to give a shout out to the necklace around my neck. This is a piece made with love from Abuelito. He is 90 years old and still makes jewelry, weaves baskets and chairs. Always smiling that man is! Now I know that you probably want to see the finished product. Am I right? Well…you can’t. I forgot to take a photo of it right out of the oven and Jose and I gobbled it up before I remembered to take a photo. So the end result is either left to your imagination or make this bread for yourself and you can send me photos of the end result.